Last weekend as we reflected on the nearness of the saints and the kingdom of heaven, how all of us are gathered at the altar at Mass, how the saints are immediate to our needs, how we are immediate to the needs of the holy souls. We literally are a prayer away from each other, a breath. It is a comforting consideration when we are confronted with the loss of a loved one, that they aren’t really gone, but rather “behind the veil” of hope that surrounds God’s faithful people. This month of November we remember in a special way all those who have gone before us in faith, and remember them with our prayers and charity. I spoke briefly in my homilies about how that thin veil between us and them can sometimes seem so very thin. 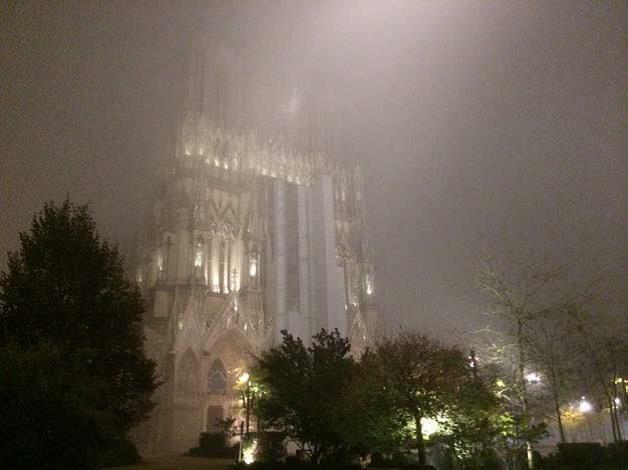 I used the experience of my encounter with the cathedral in Reims, France last week—how in the fog the lights glowed and you couldn’t tell where the spires covered with saints and angels came to an end, and where the sky began. It looked like a ladder between heaven and earth, and somewhere in that glow of light was the communion of the two. They say a picture is worth a thousand words, and since this column is usually good for about 500 I thought I would include this photo. It doesn’t begin to do justice to the experience of actually being there, but it gives an idea of the stunning vision which was suddenly in front of us as we came around a corner. If you check the history of the place, it was all but destroyed with most of the city of Reims in the Second World War. A place of such history (where kings were crowned for centuries) and such suffering stands today as a testament to the endurance of truth, and beauty, and prayer. 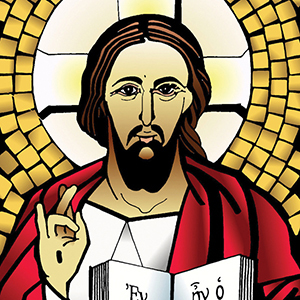 So may God’s kingdom always be.